We volunteered 50 hours, 1,500 sandwiches and in-kind donations of $782 for supplies to The Sandwich Project, a Minneapolis Homeless Ministry. In the last six years, our team has participated in Tour de Cure from the American Diabetes Association and raised $75,000! This year alone, we contributed $10,000. Restaurant Technologies donated $2,000 in gift cards and $4,000 in gifts and household goods that maintain the home. Up to 48 families can live at Ronald McDonald House Charities at a time and these donations will provide support to these families. Additionally, Cooks for Kids prepared meals four times in 2017 with over $150 donated in kind. The Restaurant Technologies team helped 46 infants, children and GMCN workers by cooking and serving dinner at two events, with four volunteers at each event, at The Greater Minneapolis Crisis Nursery. Additionally, an in-kind donation of $140 was made for supplies. We loved participating in the annual backpack drive for The Amherst H. Wilder Foundation and we were able to donate 250 school supplies. For Memorial Blood Centers, the team donated 36 pints of blood, which equates to 108 lives saved! 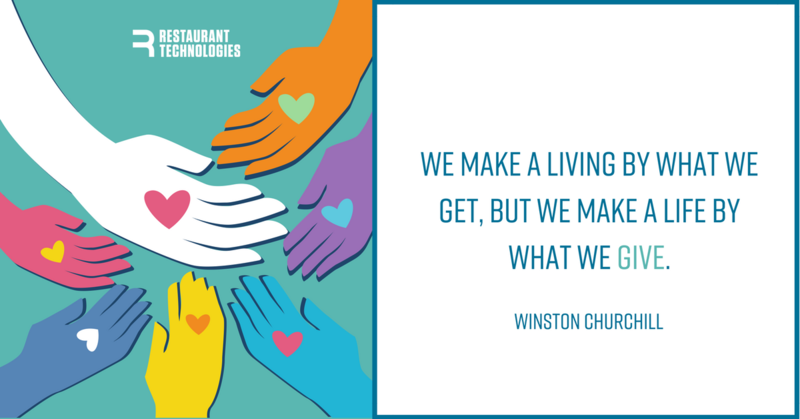 Since 2014, Restaurant Technologies has had 123 volunteers for 10 events feeding over 80 children a meal for a year with Feed My Starving Children. Did you know that 138 Restaurant Technologies employees are veterans? We love our vets. Our team collected over 500 snacks and distributed holiday cards to deployed military personnel with Soliders-6. Two large bins of pet supplies were donated to Wags & Whiskers from the Restaurant Technologies team members. Our Giving Garden produced over 325 pounds of produce. 30 volunteers made it happen! The Restaurant Technologies Disaster/Hardship Relief Fund was created to help employees challenged by the hurricanes this year. With 100% company matches, $10,815 was donated by employees, which totaled in $21,630 disaster relief funds. Additionally, 618 PTO hours were donated and 40 hours were granted.